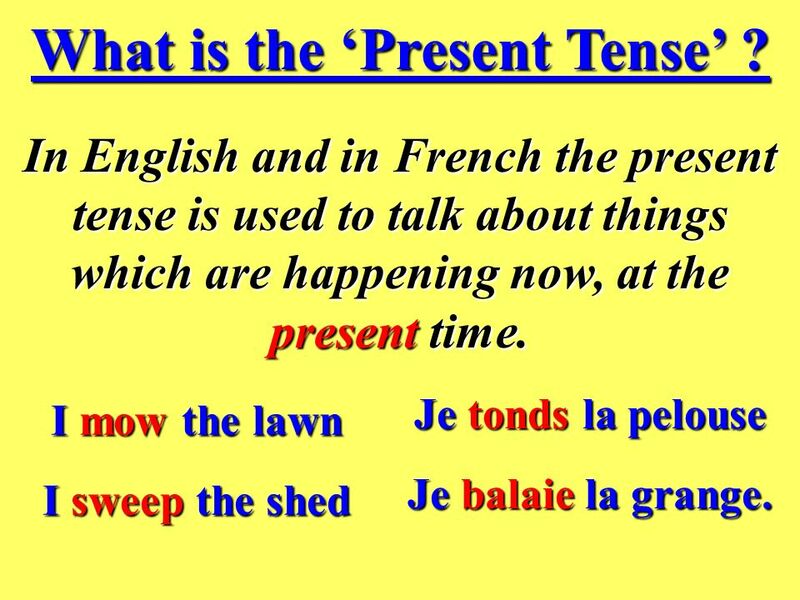 2 What is the ‘Present Tense’ ? 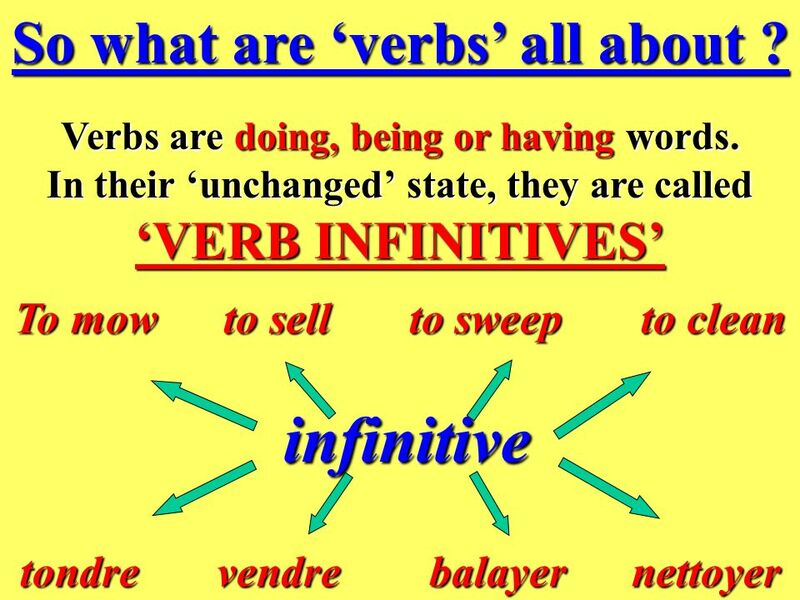 3 infinitive So what are ‘verbs’ all about ? 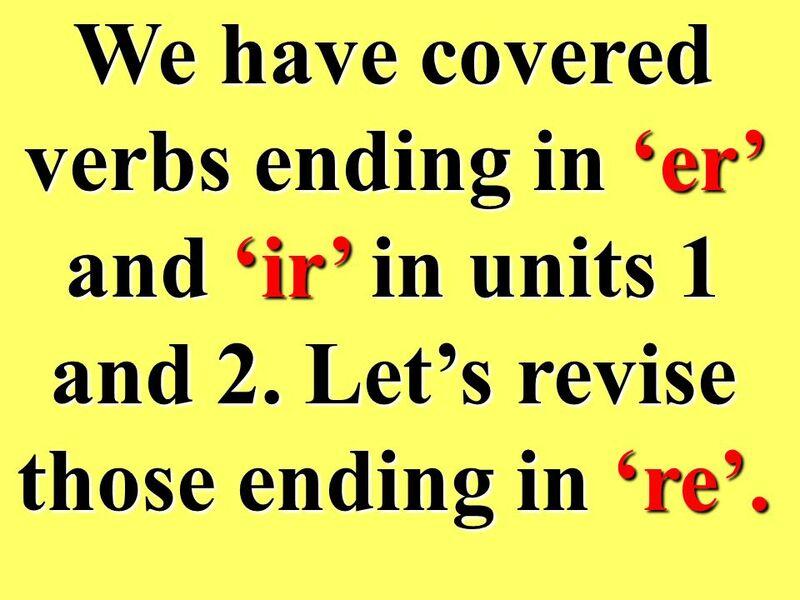 We have covered verbs ending in ‘er’ and ‘ir’ in units 1 and 2. 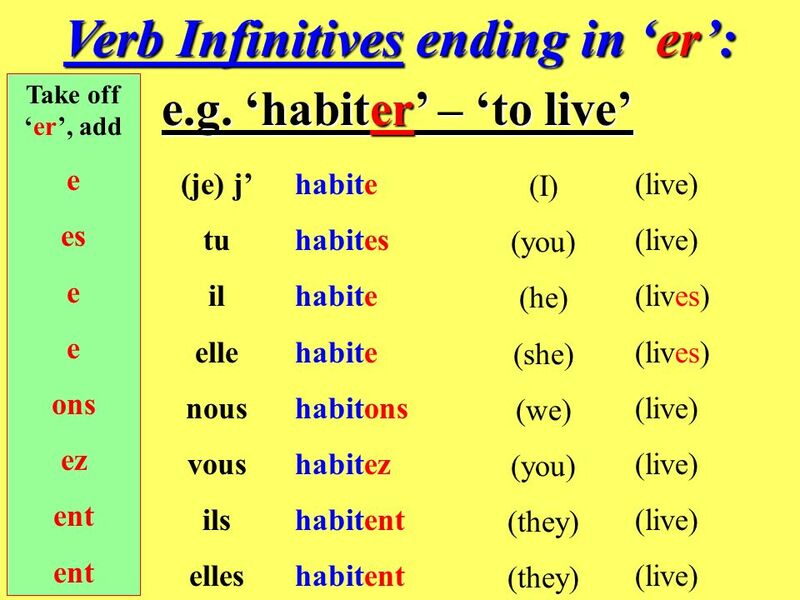 Let’s revise those ending in ‘re’. 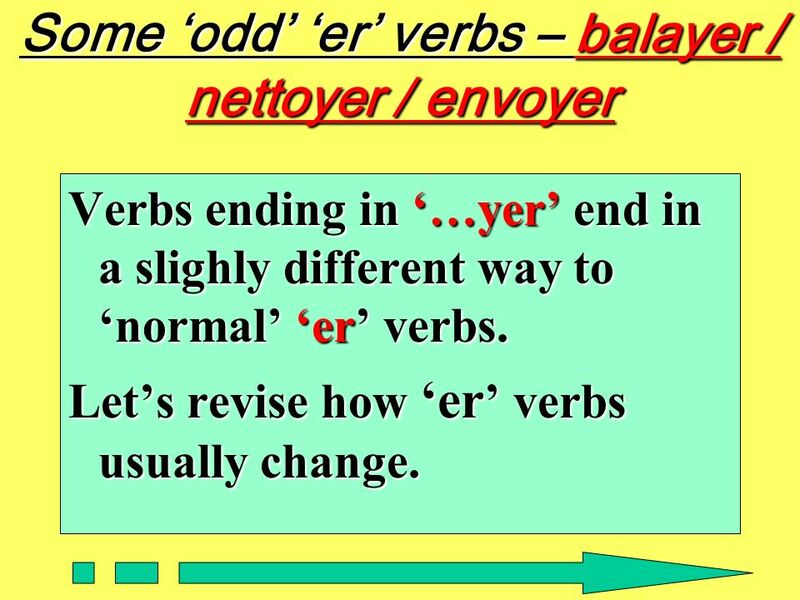 Verbs ending in ‘…yer’ end in a slighly different way to ‘normal’ ‘er’ verbs. 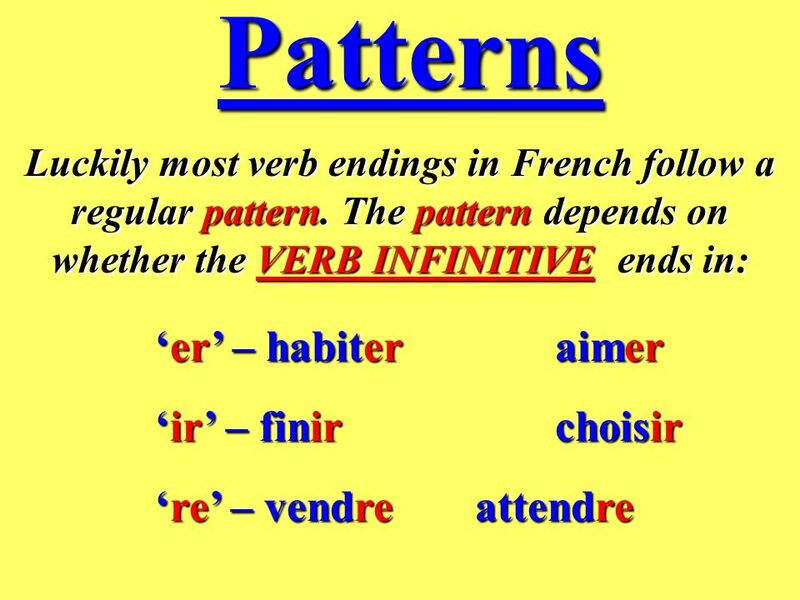 Let’s revise how ‘er’ verbs usually change. 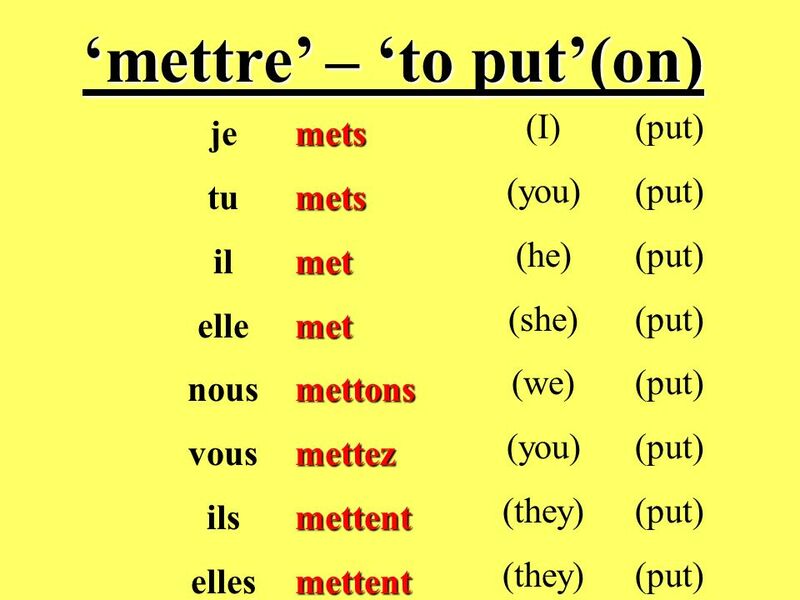 13 Translate these phrases into French. 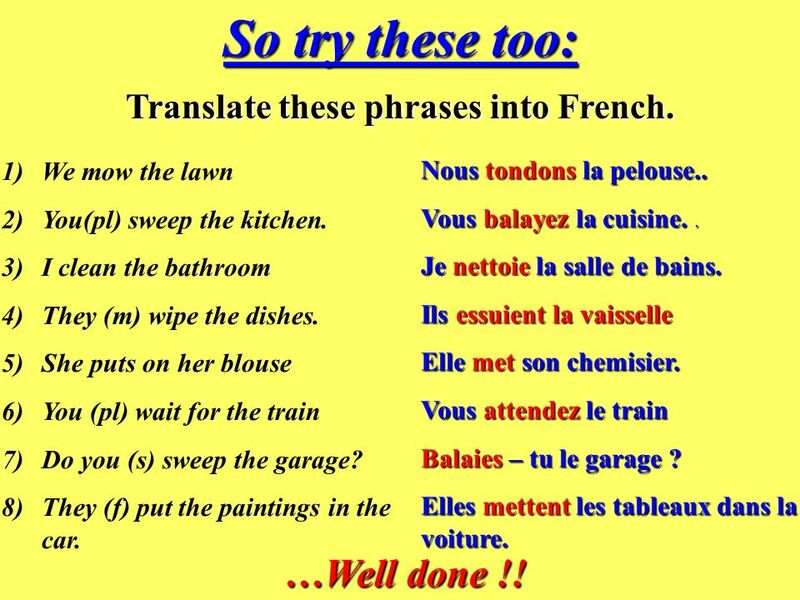 So try these too: Translate these phrases into French. 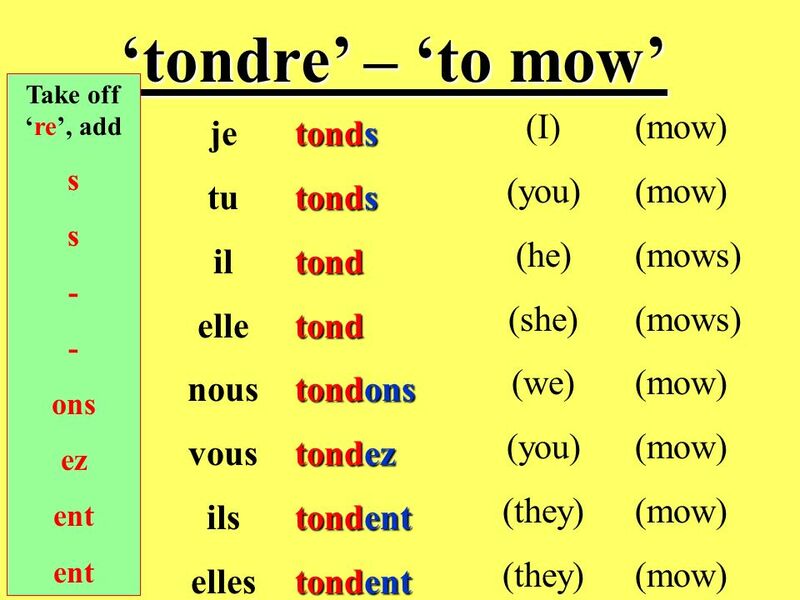 We mow the lawn You(pl) sweep the kitchen. I clean the bathroom They (m) wipe the dishes. 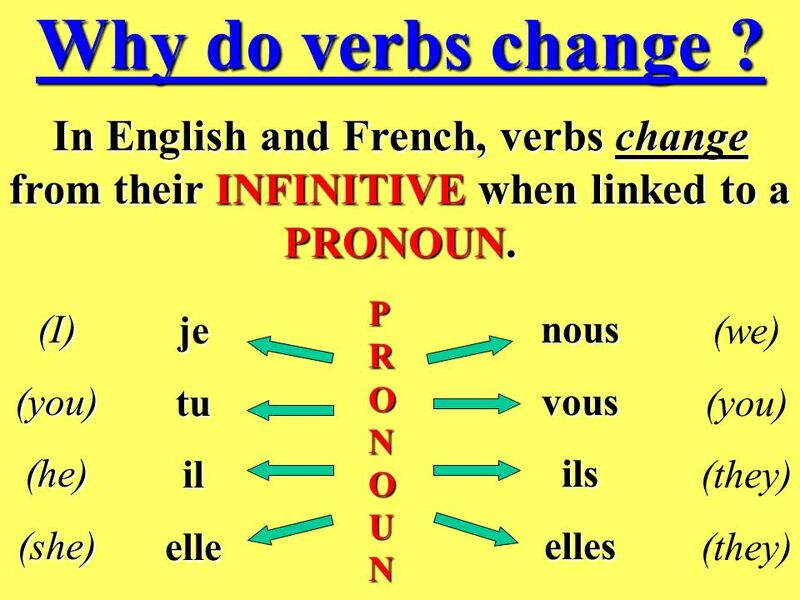 She puts on her blouse You (pl) wait for the train Do you (s) sweep the garage? They (f) put the paintings in the car. 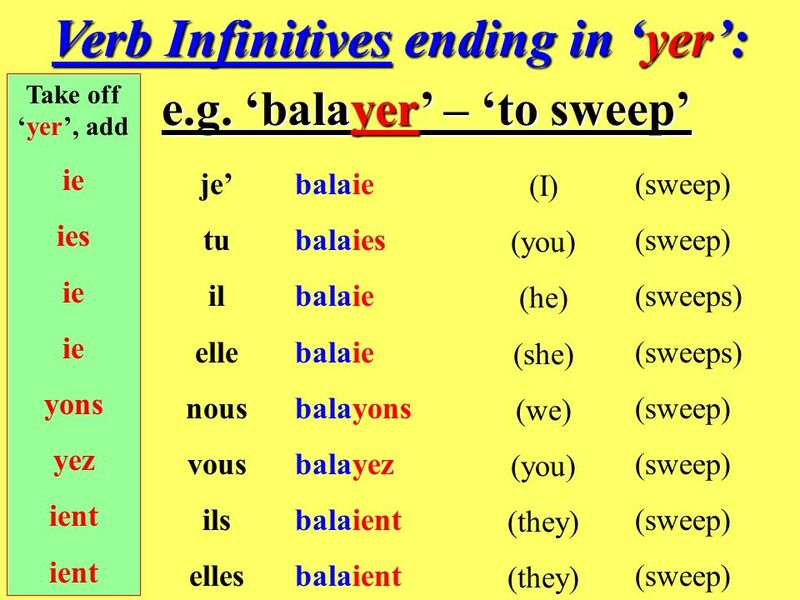 Nous tondons la pelouse.. Vous balayez la cuisine. . Je nettoie la salle de bains. Ils essuient la vaisselle Elle met son chemisier. Vous attendez le train Balaies – tu le garage ? Elles mettent les tableaux dans la voiture. 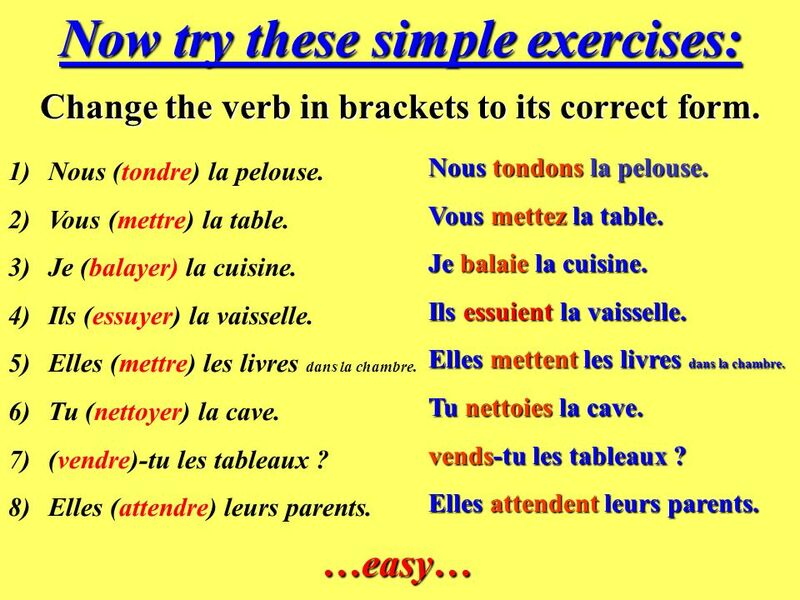 …Well done !! 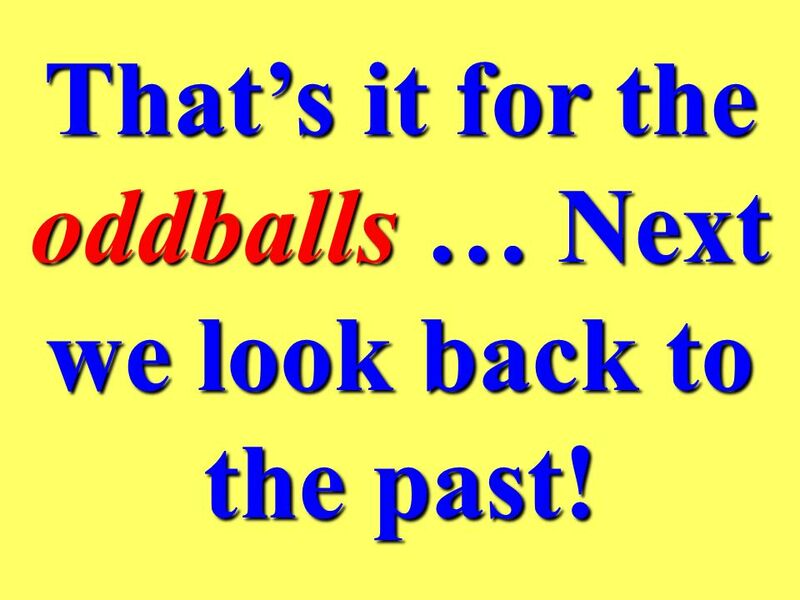 14 That’s it for the oddballs … Next we look back to the past! 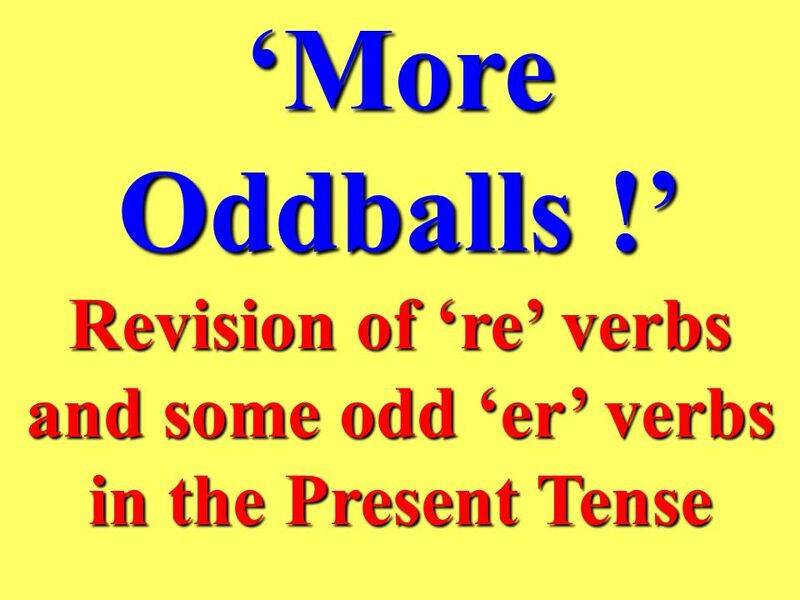 Télécharger ppt "Revision of ‘re’ verbs and some odd ‘er’ verbs in the Present Tense"